John Harding joined Martin Kane Kuper in 1992 and has been a partner in the firm since 2007. He focuses almost exclusively in the area of litigation. 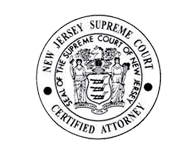 His trial experience in the areas of Personal Injury, Automobile Liability and Landowner Liability has resulted in recognition by the State of New Jersey as a Certified Trial Attorney in the area of Civil Law. John has successfully argued matters in both State and Federal Court. He is also active in the area of Dispute Resolution having been appointed as an Arbitrator in numerous personal injury matters and serving as a Mediator for the Middlesex County Superior Court, Law Division also in the area of personal injury. John is also Certified as a Lemon Law Mediator by the Better Business Bureau. John received his Juris Doctorate from the Rutgers School of Law in Newark in 1991. He was then appointed Judicial Clerk to the Honorable Joseph J. Salerno, Judge in the Law Division, Superior Court, Passaic County, New Jersey. He is admitted to practice in the State of New Jersey and the Court of Appeals, Third Circuit. John is former President of the Middlesex County Trial Lawyers Association. He is a member of the New Jersey State Bar Association, the American Board of Trial Advocates, the New Jersey Defense Association and the New Brunswick Bar Association and is past Vice-Chairman of the Highland Park Zoning Board. He also has chaired the annual Toys for Tots toy collection drive in association with the U.S. Marine Corp. Reserves. John has earned the distinction of being named a Super Lawyer by his fellow attorneys.